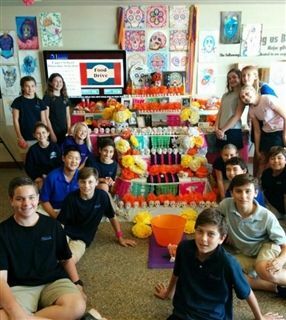 World language classes, visual arts classes, the Latinos Unidos affinity group and the Parents Association joined forces to celebrate El Dia De Los Muertos on Monday. Last week, students helped create a beautiful altar in Mullady Hall. Language students decorated the altar with handmade, traditional crafts, visual arts students painted sugar skull watercolor prints to surround the altar, and all members of the Pacific Ridge community were invited to participate by placing photos or objects on the altar in honor of departed loved ones. Latinos Unidos also offered to paint "calaveras," or sugar skulls on students' faces as part of Pacific Ridge's Day of the Dead celebration.